Sometimes it may seem that the onchange for a boolean value associated with a checkbox isn’t getting set properly or won’t respond to the onchange event. It works locally, but not on SharePoint. What’s really happening is that the change isn’t being sent to the server immediately. 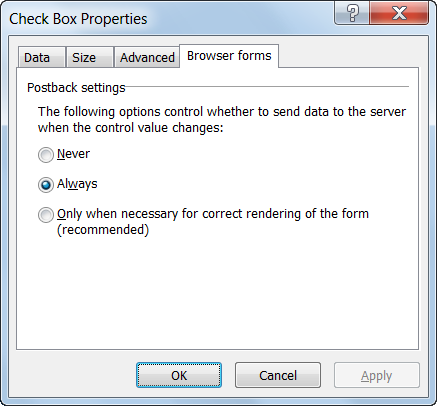 To fix this, go to the checkbox’s properties and in the “Browser forms” tab set the “Postback settings” to “Always”. November 8, 2012 No Comments.